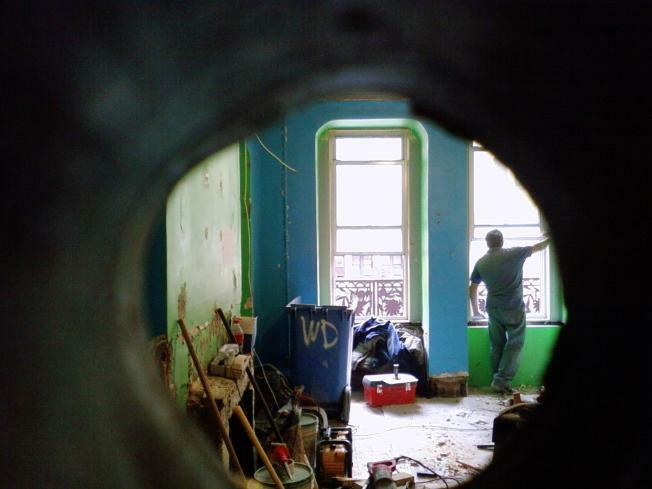 A peak inside Bob Dylan's old room at the Chelsea Hotel shows construction trash and tools. Is the current Chelsea Hotel management really destroying Bob Dylan's legacy with a sledgehammer? That's the word coming out of the Chelsea Hotel Blog, which yesterday posted alleged pictures of room #211 showing that it "has been completely trashed." It was there that Bob Dylan lived in the 60's, penning such classics as "Sad Eyed Lady of the Lowlands" and many other great songs from his Blond on Blond album. As if the recent construction isn't enough to tarnish the building's history, numerous bloggers are reporting that it's being conducted with "illegally obtained permits," that only allow for renovations of the bathroom and kitchen. Gothamist thinks the original managing partner, Stanley Bard, "would surely object." Curbed agreeds that the place looks utterly destroyed, and that the DOB is getting an earful. They noted, "In fact, the place looks trashed. It's a bit hard to tell from the artsy photo above (this is the Chelsea, after all)." They go on to add, "Needless to say, the DOB is being swarmed with complaints about the work." A quick check on the DOB's website shows a number of these complaints, alongside the DOB's response.